"They're the only labor cheaper than clones." Install from archives, saving all costs: The following cards allow the corp to install a card from archives ignoring costs (most notably for adding ice to an already defended server): Director Haas' Pet Project, License Acquisition, Team Sponsorship, Architect, Howler & Interns. While each of these have their own unique niche, Interns stands alone as being the easiest to use, as an operation itself, it's ready to fire without needing an agenda to be scored or waiting for the runner to do something. Other recursion: Jackson Howard, Archived Memories, Allele Repression, Crick, Project Vitruvius, Shannon Claire are all examples of other recursion methods, each of which offer unique strengths, Interns may at times be preferable in cases where it's flexibility offers the corp the option to use either it's savings (when installing additional ice) or for it's recursion ability when installing cards. 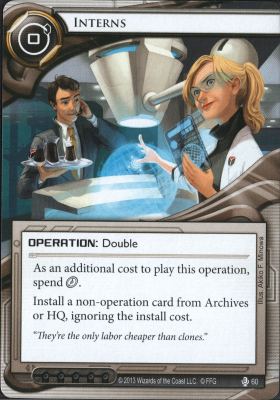 Recursion synergy: Used in combo with Jackson Howard (or some other recursion method) may allow the corp to recur one specific card and thereby reserve Jackson Howard for later when there are enough useful cards in Archives for the timing to make sense. Recur Assets & Upgrades: Increasingly upgrades such as Caprice Nisei o Ash 2X3ZB9CY etc or critical assets can become so threatening to the runner that the runner must target them. Using Interns to recur & re-install such an asset immediately after a runner went through considerable expense (perhaps getting through taxing ice) to it could potentially make the runner rather sad. Recur Agendas: There may be times when an agenda gets sent to Archives where the corp would really prefer to be advancing it in a server. Interns provide one option to do so, however due to it's "Install a card" wording the corps options are a bit more limited when compared to other recursion methods. Economy boost: Combined with Haas-Bioroid: Engineering the Future in addition to using Interns to get a card installed, bank a little cash. Ice installation Savings: Potentially significant savings on installing yet another piece of ice onto a server. Flexibility: Interns allows the corp to recur & install any install-able card from Archives or simply go for savings by installing ice out of HQ. Interns sees some use in popular decks, notably as a Noise: Hacker Extraordinaire counter or to keep the pressure on the runner with assets. There are certainly other cards that can hit one aspect of what Interns dual abilities offer and many of them do so to greater affect, however if you need it's flexibility specifically rather than targeted power Interns does what it says.